YAY It’s Christmas! December is Way Too Busy! Hi everybody. I haven’t had a second to blog all month. December is stressful. All the pushing and shoving, shopping, crowds and parties. It’s zausting! I started my month in Harrisburg at the League of Women Voters board meeting. 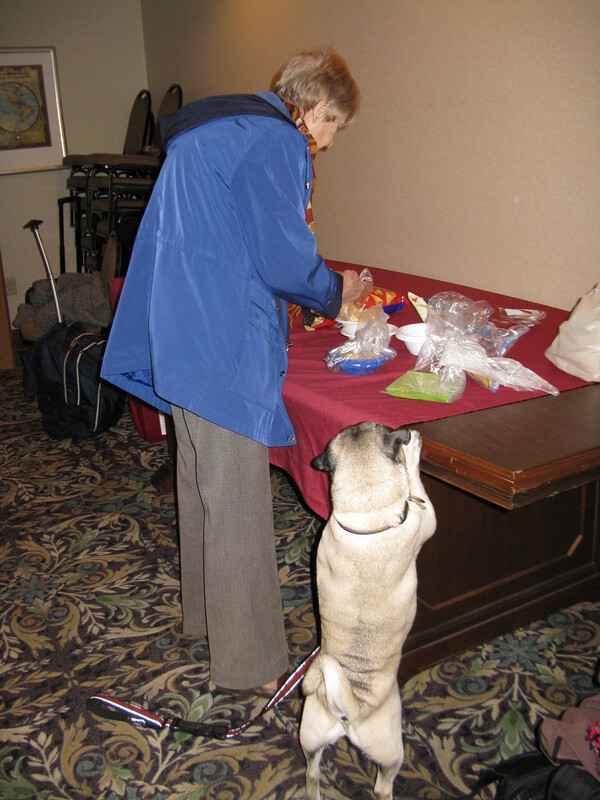 My mom and Aunt Marita went a day early to go to the big Christmas Craft Show and I got to go to Canine Clubhouse for the day. That was so much fun. I played with a little girl named Zoe. Really, she followed me everywhere. All the boys who are regulars there didn’t like that. I think they’ve all been fighting over her and here I came for the day and stole her heart. Get over it boys. I’m Pugsley! Then something amazing happened. Miss Sadie called everyone to the table for lunch. Zoe told me it’s the afternoon meal. Whaaaaaaat? Why hadn’t I ever heard about this meal called lunch? I get breakfast and dinner at home. You mean there’s a third meal in the day? I made a note to ask my mom about this in the most stern voice I could muster. I had seen my mom eat in the middle of the day and I thought it was a snack. Everyone sat at the table and when Miss Sadie came to me I ordered a turkey hoagie and tater tots. The other kids fell over laughing. I got kibble. It was chicken flavored. Close enough. When mom and Aunt Marita picked me up later in the day I yelled at my mom something awful. How dare she deny me lunch all these years! That night a whole bunch of firefighters and EMTs checked into the hotel. They were there for training with FEMA. We watched football and drank beer in the hotel lobby. I wanted to go with them on drills the next day and remembered that I was already booked. I HATE when that happens. The next day was the board meeting and I had to work. Miss Carol likes to sit next to me. I like that because she’s so smart. In fact, she’s freakishly smart. Like 1,000 IQ smart. Mom and I always hope some of her smarts rub off on us. 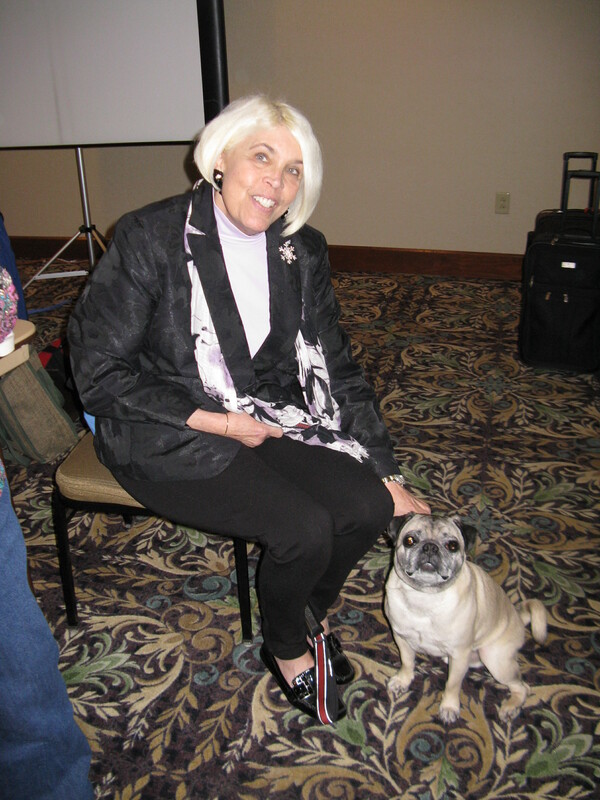 Miss Sharon was at a conference in Florida. She’s crazy smart too. I just know that if she was there, she and Miss Carol would have had a lady fight over who would sit next to me. Here I am with Miss Carol. She lets me walk her sometimes. She loves me! Miss Betty is getting snacks. Hi Miss Betty. Is there anything for me on the table? Now Miss Susan is jealous. I have to visit with her. These board meetings are such hard work. That night we saw ladies whom we remembered from last year. They were having a pajama party by the lobby fireplace. They let me hang out with them and drink wine and eat cheese and crackers even though I forgot to pack my pajamas. 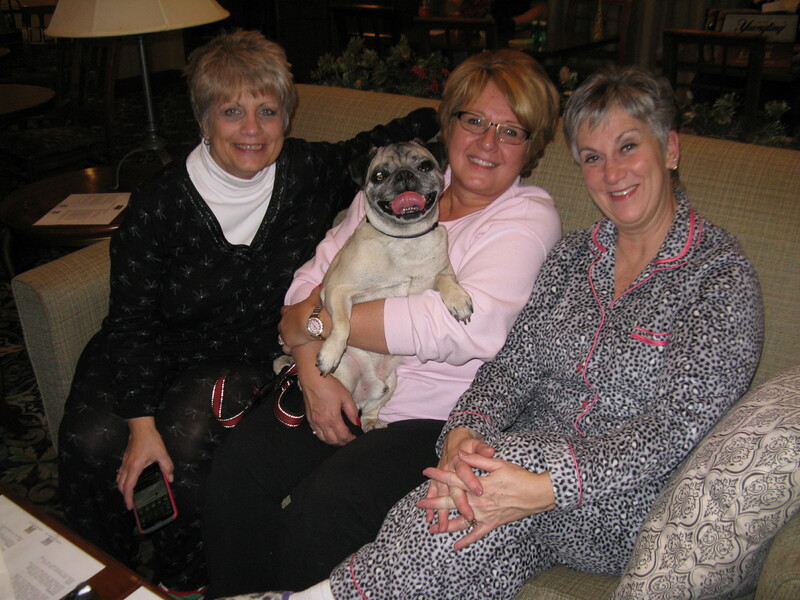 Here I am with my friends Karen, Bonnie and Sue from Bellefonte. Oh I hoped my mom didn’t come looking for me. I was a little tipsy by the time the photo was taken. I told Miss Carol that I wanted to sleep in her room that night so I waited for her to pick me up. It seemed like forever and I was happy to stay with my friends and eat more snacks. I don’t know what happened. Miss Carol never came for me. I’m sure she must have just forgotten. Yeah, that’s it. She couldn’t possibly have not wanted to bunk with me. I went back to my room and hoped that mom wasn’t sleeping yet because I didn’t have a key to let myself in the room. The next morning mom and I saw the firefighters in the lobby packing up their gear for more training. They all remembered me and everyone was yelling my name and saying good morning. I thanked them for their service and wished them a happy day. 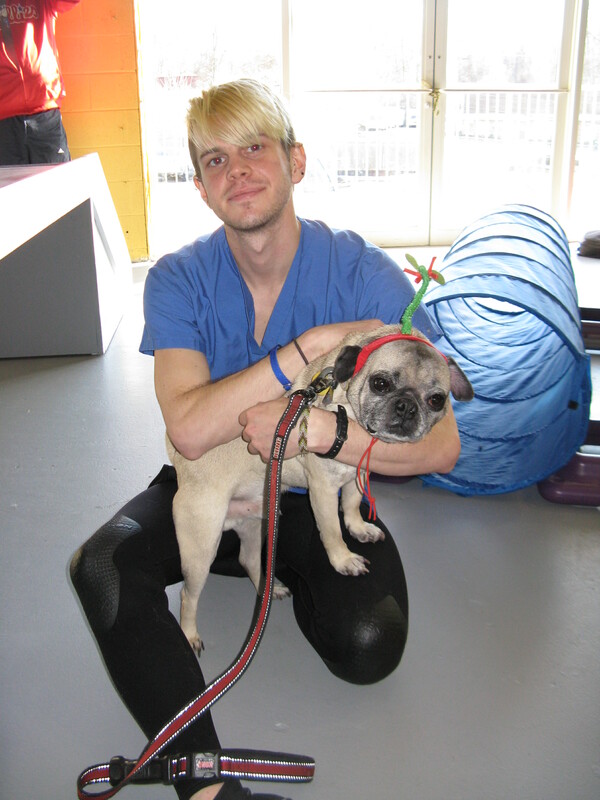 The next day mom took me to Family Pet Resort for their Christmas Party. Mom took my seatbelt off and forgot my leash was attached to it. I ran around the place checking out the other kids and evading capture. I snuck into Santa’s treat basket three times before I was wrangled. Boy was that fun! 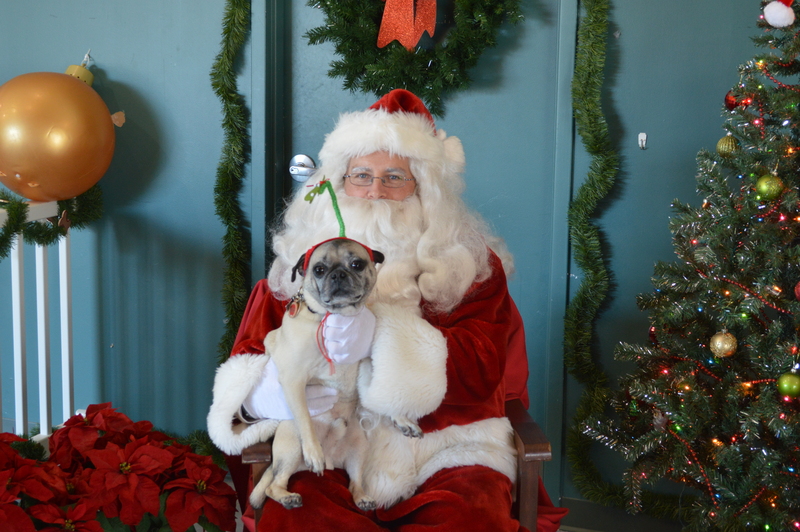 I had my picture taken with Santa. I knew he wasn’t the real Santa because he didn’t kiss me. What Santa doesn’t know you’re supposed to kiss the person under the mistletoe? 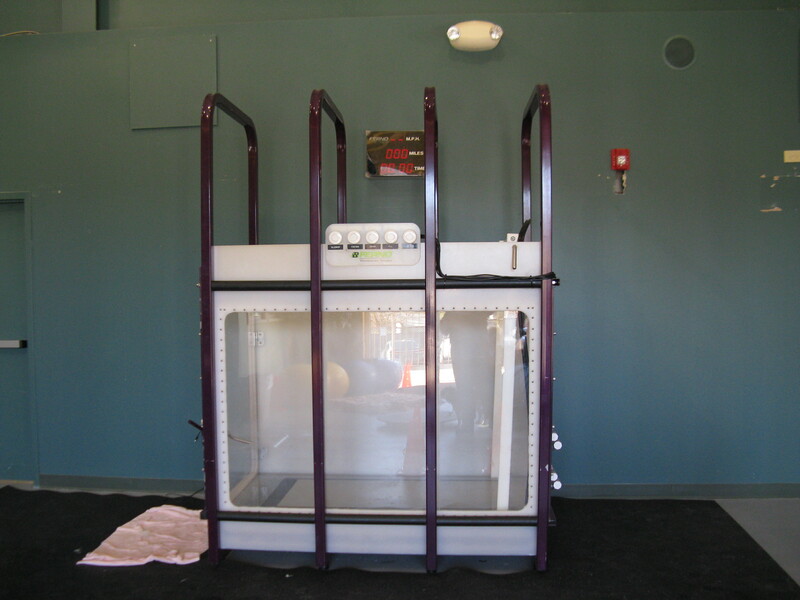 Family Pet Resort was launching its new Aqua Therapy machine. That’s physical therapy talk for underwater treadmill. It looks awesome. I got to play with the other equipment. 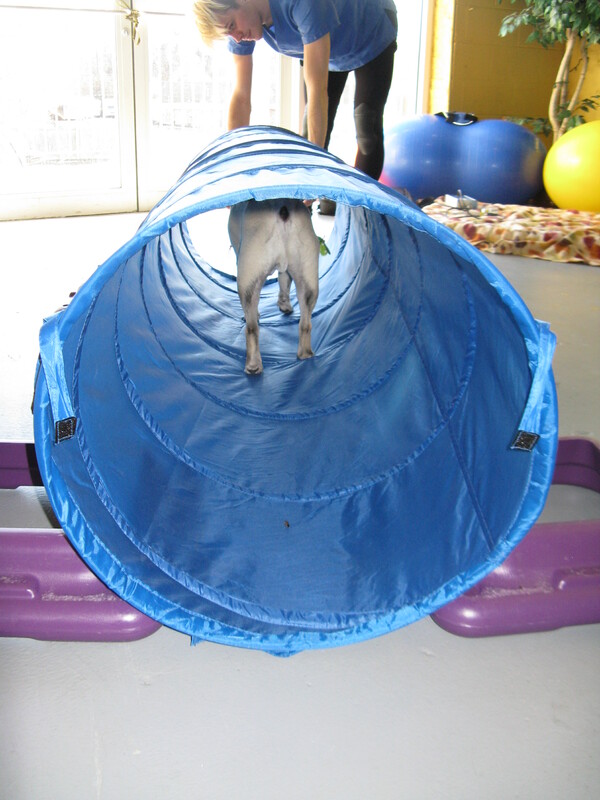 The tunnel is my all-time favorite. And here I am with Jon, who was working with me. 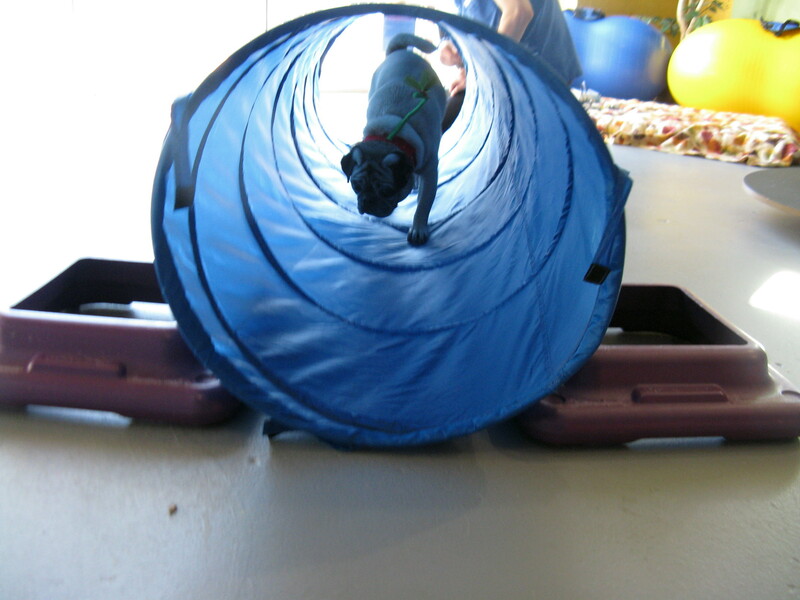 He’s a trained physical therapy professional and was very impressed by my agility on the equipment. While I was there I had a dental exam. I’ll do anything for treats. And a photo with the Christmas Dog. Mom took me to Pet Smart for a pawdicure with Anna. There were two girls, a Pekinese and a Chihuahua, getting primped for the holidays. I got a spritz of Eskimo Mist (or was it Eskimo Pie?) cologne. Talk about a lady fight! All that yapping and hair pulling over me. Who can blame them? 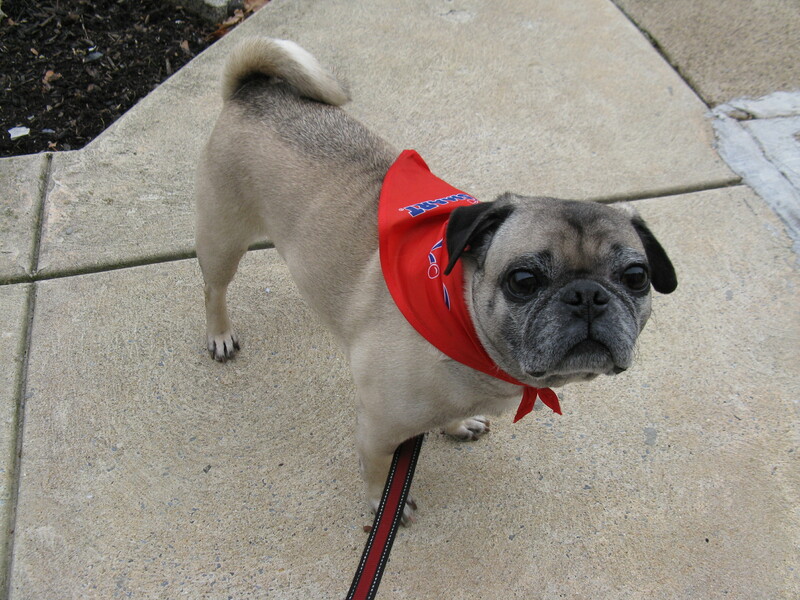 Here I am looking so dapper in my bandana. The best day of all was when mom took me to Mr. Todd’s photo studio for professional photos. That was such a fun day. Mr. Todd played with me and let me help with the equipment. We just got the photos back so now we can write our holiday cards. Who cares if they arrive for Groundhog Day? You can’t rush cuteness. 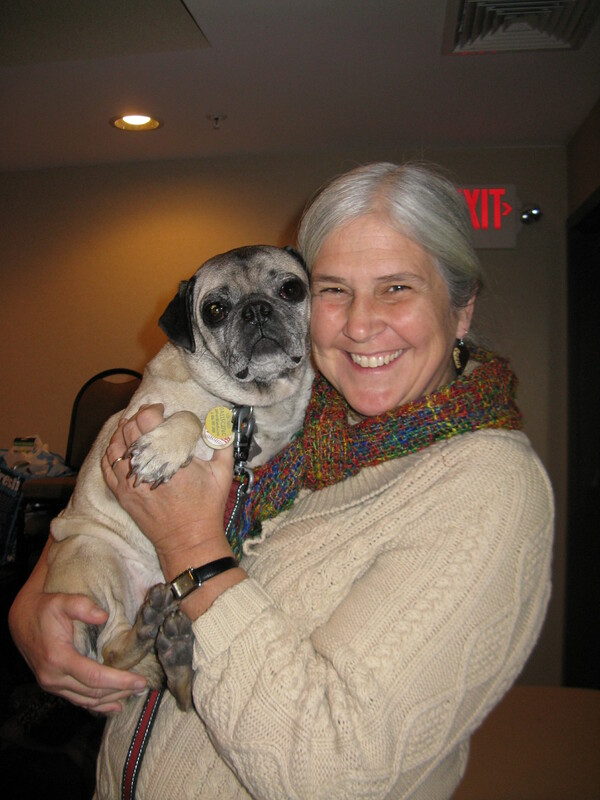 Mom went to Sacred Journeys for a Gazpacho ceremony to celebrate the Winter Solstice. Mom said it’s Despacho, not Gazpacho. A Despacho is an ancient Peruvian ceremony lead by a shaman (my Aunt Shari). Participants construct an offering of gratitude to Pachamama (Mother Earth) and the Apus (Mountain Spirits). Everyone places prayers into the Despacho. They are prayers to release things that no longer serve them and things that they want to manifest. These prayers are then “dispatched” to the Guides and Spirits when the offering is burned by the shaman. Mom said it was incredibly moving and spiritual. 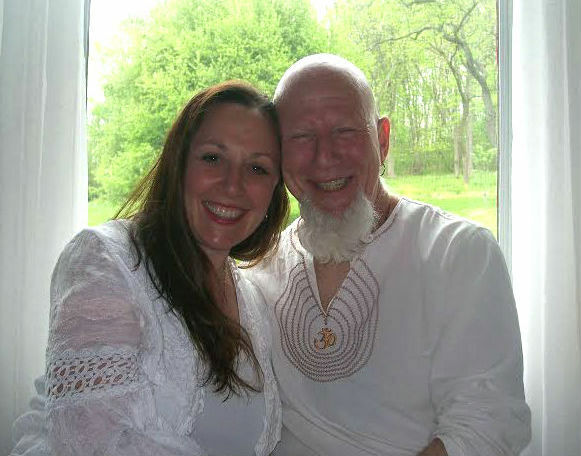 Here are my Aunt Shari and Uncle Jonathan. They’re wonderful! Last weekend mom went to Uncles Jerry and Dale’s annual tree trimming/Hanukkah party. 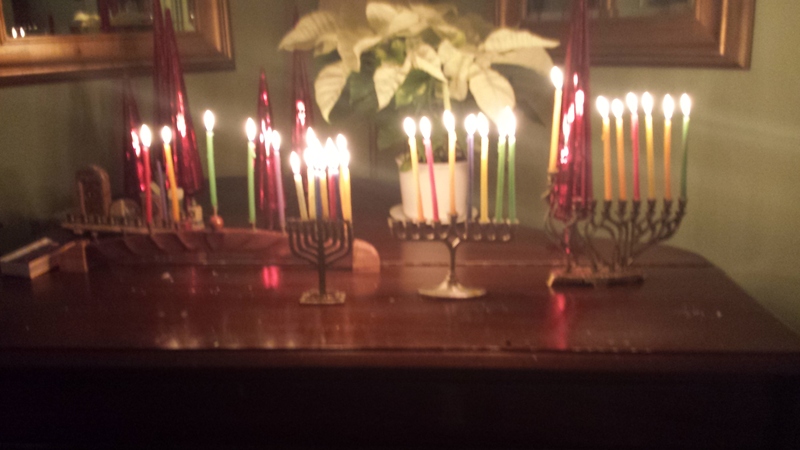 Uncle Jerry laughed and said, “Notice that the Goyim (non-Jewish people) have five Menorahs.” The candles didn’t fit into the Menorah from Jerusalem. I guess Uncle Jerry will have to go to Israel and buy candles for next year. That’s an expensive Menorah! 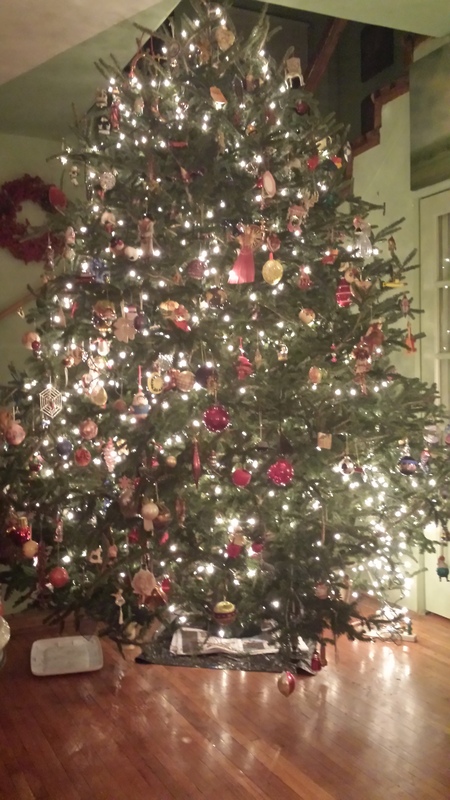 The kids decorated the biggest Christmas tree I ever saw. Look how beautiful it is. With mom’s addition, there are now five Phillies ornaments on the tree. Maybe Santa will get the hint. Mom had a great time catching up with her friend with Miss Ethel, who writes an email every night about Philadelphia sports news of the day. How she’s not depressed and in therapy is another Hanukkah miracle. 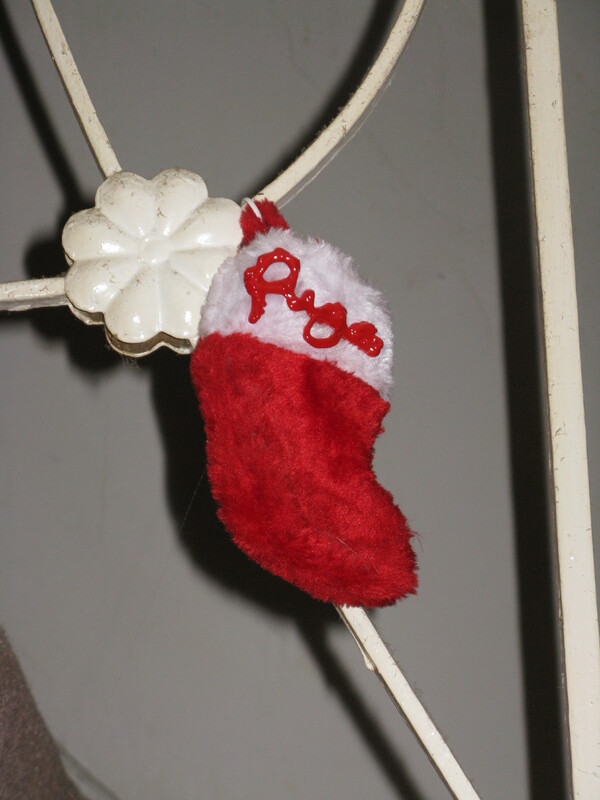 Mom hung my stocking last night. I think she’s trying to tell me something. It’s pretty size-accurate. It looks like I’m getting coal again this year. Maybe I shouldn’t have stuck my head into Santa’s treat basket so close to Christmas. I was good all year and I do one naughty thing right before Christmas and I get coal. Humbug! So mom and I wish everyone a belated Happy Hanukkah, a Merry Christmas and a Happy New Year filled with blessings, joy and love. 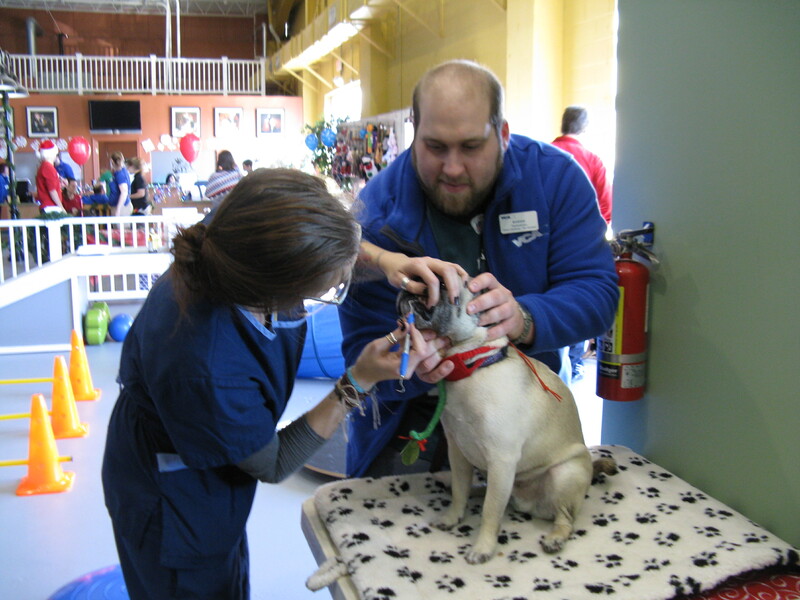 This entry was posted in Uncategorized and tagged Canine Clubhouse, Carol Kuniholm, Dale Wilcox, Ethel Goldberg, Family Pet Resort, James Jerry Clark, Jonathan Miller, Pet Smart Springfield, Sacred Journeys, Sharon Kletzien, Susan Leinberger, Todd Rothstein Photography by pugsleysworld. Bookmark the permalink. 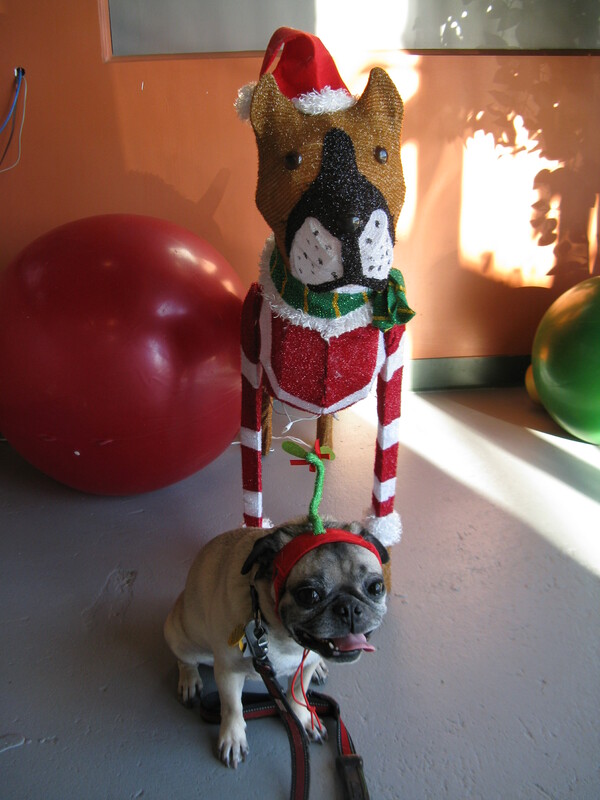 Happy Holidays Heidi & Pugsley and best wishes for a happy, healthy New Year!!!! To you too Miss Karla!!!! and your forgot to tell everyone that Mom has a birthday sandwiched in between Christmas and New Years…..She is one great woman…..Love, Unc.